On the surface, “Brooklyn” has everything a No Reservations episode should have. Tony bums around a land foreign to him with an assortment of locals, revered chefs, and stars from his favorite TV shows and/or musical groups. He eats everywhere from a secret loft, where he has charbroiled octopus, to a dingy diner, where he has a pastrami sandwich. He even manages to convince his friend and the show’s oddball recurring character Zamir to shoot goblets of vodka with him in Brighton Beach to a pulsing, Georgian disco beat. If there were a bingo card for a No Reservations series finale, “Brooklyn” would have swept it. So why didn’t it feel like a finale? For one, Bourdain’s sojourn with The Wire’s Michael K. Williams seems less like an opportunity for us to get to know Williams’ Brooklyn neighborhood than an opportunity for Bourdain to hang out with The Wire’s Michael K. Williams. For a minute, it felt like the show was going to devote half the episode to Bourdain watching Williams greet people while telling us about the “badassest, greatest show on television.” Bourdain’s gushing isn’t necessarily a deal breaker, but it immediately slows any momentum the episode’s opening roller coaster sequence tried to jump start. We get it, Tony; you like The Wire. Have you met my good friend, the Internet? You two would get along. In the episode’s second half, though, Bourdain eases up on the cool factor and settles into something much more interesting: his age. He may not be done getting drunk and/or tattoos yet, but he has undeniably matured during No Reservations nine-season, 142-episode run. He has traveled around the globe several times over, gotten married, and had a kid. He’s launched a vendetta against the idea of a “celebrity chef” and Paula Deen’s artery-clogging butter brigade. He’s gone from executive chef to professional connoisseur. In other words: Bourdain’s flipped his script. Therefore, as a Jersey-bred guy and Manhattan-trained chef, Bourdain is downright perplexed by Brooklyn’s surge of trendy youth and their fusion restaurants. He clearly feared the youthful, bearded Brooklyn reaper, or at least found the entire demographic intimidating enough to avoid. His only Brooklyn venture in a previous New York episode was safely in sight of the Brooklyn Bridge. So while most of Bourdain’s best episodes are those that go international and make them feel local, launching his last season with Austin and ending with Brooklyn perversely works; they’re the two cities whose culinary scenes have blossomed almost entirely during No Reservations’ eight-year run. To Bourdain, they’re both as foreign as any far-flung corner of the world. The final sequence of Bourdain eating a pastrami sandwich under a fluorescent light was a fitting way to go out, but “Brooklyn” really sings when Bourdain allows himself to feel the shift in the culinary guard. That may mean gaping open-mouthed with his silver-haired French counterpart Eric Rippert at the precision of a 26-course tasting menu. 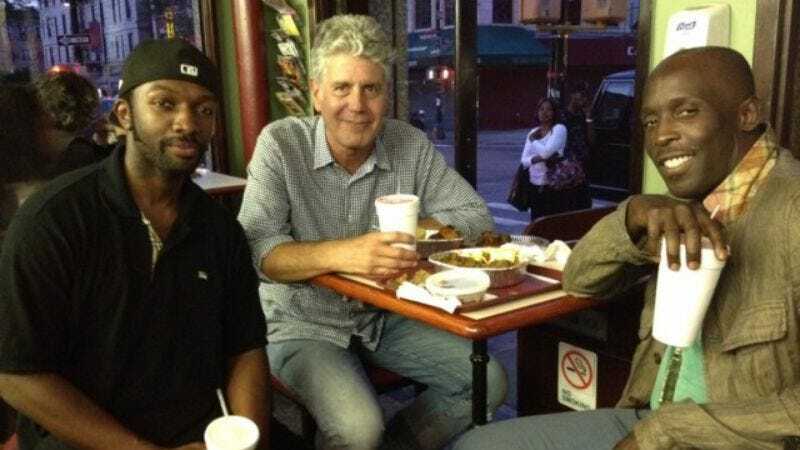 It may mean telling “the finest lyricist in the history of rap,” Talib Kweli, “So much is happening out here, and I’m not young enough or fast enough.” As long as Bourdain continues trying to surprise himself, it’s a treat to watch. Any reminiscing on what it means to end this chapter is kept to a bare minimum. Bourdain’s signature philosophical voice-overs only acknowledge the finality of it all as the credits roll by, at the beginning and the tail end. “Brooklyn” almost seems less like a series finale to No Reservations and more like a prequel to whatever his CNN project will be. Rather than wax poetic about what it means to Move On, Bourdain simply tells his viewers to… well, move. Maybe not as far as he has, but at least “across the river,” where tantalizing oysters and unexpected conversation may be waiting. Opinions on Bourdain may actually be as polarized as the United States’ current political climate (i.e. you love it, or you devote snarky hate-blogs to it). Whether you missed a lengthier reflection or not, though, it becomes clearer as the finale winds down that the decision to keep the introspection to a minimum was a deliberate one. With an unaired season of The Layover and a new CNN show on the horizon, Bourdain is on the move. As Bourdain pointed out on his various social media branches, many of the places he visited in this finale were, in fact, directly in Hurricane Sandy’s path. Here’s hoping for their speedy and full recoveries. I appreciated Bourdain’s attempts to show the less trendy parts of Brooklyn, but I wish his Red Hook trip had included, you know, food. A beer with the guy Central Casting designated as “Grizzly Brooklyn Personified” is great and all, but unless you count it as his daily starch, it feels out of place in an episode packed to the gills with dishes..
No Reservations’ production has only gotten more impressive with time. The pace, loving shots of meat grilling, and graphic title cards perfectly match Bourdain’s aesthetic. My favorite moment of the episode came courtesy of the camera catching a random diner at Brooklyn Fare exclaiming, “Oh my God” at the food, despite himself. If the CNN show turns out to be a Bourdain/Rippert buddy chef show, I wouldn’t complain.